Now add chopped shallots, carrots, peas and mix well. 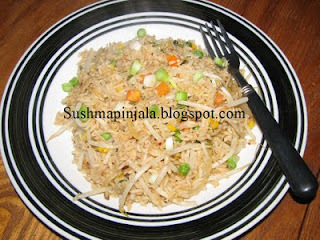 If u cook the rice 1 day before, cool it and refrigerate it. Remove the next day and prepare the fried rice. It tastes better than the freshly cooked rice. After adding rice, add chili sauce, soy sauce, salt and crushed black pepper. Add sprouts and mix well. Switch off the stove and garnish with chopped green onion. Yesterday i made chicken curry for lunch and some of the curry was left out. Today we were not interested to eat the leftovers. Then I thought of making chicken puffs with the leftover curry. Defrost the puff pastry sheets and cut them to the desired size. Top the puff sheet with the spoon full of chicken curry. Make sure the chicken pieces are very small. Now fold them as shown in the below picture. Place them side by side in the baking tray. Pre-heat oven to 350 degrees and bake the puffs for 10 mits on each side. 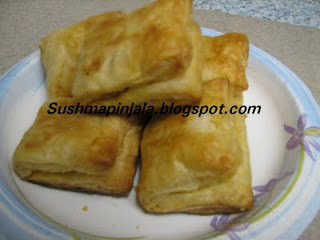 U will know whether the puffs are done, if not done bake them for another 5 to 10 mits. Serve hot with any ketchep or sauce.